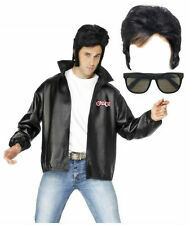 Fantastic Official T-Birds/Grease leather-style Fancy Dress jacket. Old school styled mop hat design. 1 x Mop Hat. Ideal accessories for Victorian related school plays. Victorian Kit. Goes well with solid coloured dresses and clothes. Size: 7-9 Years. FANCY DRESS COSTUME # GIRLS PINK LADIES LADY GREASE LG.